The Rangers are looking to continue their success on the road and against the Western Conference tonight against the Chicago Blackhawks. Photo courtesy of MSG Photos. The Rangers (39-17-7) continue their road trip tonight against the Chicago Blackhawks (39-21-5), the only remaining team that the Rangers have not played yet. The Rangers had two days off at home before practicing Saturday afternoon and heading out to Chicago for the second game of their five game road trip. Alain Vigneault stressed rest and recovery, especially with tonight’s showdown beginning a series of three games in four days. After tonight, the Rangers will head to Nassau for the final regular season matchup against the Islanders before going down to Washington D.C. to take on the Capitals. New York has fared well away from the Garden, with a solid record of 18-10-2 on the road. The Blueshirts also have a seven game point streak (5-0-2) against Western Conference teams, their best since the 1996-97 season. They are also 5-1-1 in their last seven games on the road. The Rangers last game was on Wednesday, a 2-1 overtime loss in Detroit. Dan Girardi scored the only Rangers goal on the power play, and Cam Talbot made 29 saves in one of his best performances of the season. They managed to get 40 shots on goal, but could not finish on some of their other quality chances. Cam Talbot has been really solid in net for the Rangers, and is looking to build on his strong performance in Detroit on Wednesday. Photo courtesy of MSG Photos. With the Islanders losing in the shootout to the Florida Panthers last night, the Rangers sit just three points back with four games in hand. Tonight presents an opportunity for the Rangers to make up some considerable ground before these two teams face off on Tuesday. Tonight also starts a streak of 19 games in 35 days to close out the season for the Rangers, which will be a tough end of the season test for a team that has been really good lately, going 9-1-2 in the last 12 games, all without Henrik Lundqvist. The Blackhawks have a lot of talent, but were forced to make some trades once star player Patrick Kane went down with a broken clavicle. Chicago picked up Antoine Vermette, the center from the Arizona Coyotes, and Kimmo Timonen, the veteran defenseman from the Philadelphia Flyers. Neither of them have a point in their two games as a Blackhawk, but Vermette is a skilled player and a good at faceoffs. He has some confidence after scoring the game deciding shootout goal over Edmonton, so he’s someone to look out for. This is also Brad Richards first season in Chicago, and he has 32 points (9-23-32) in 62 games, sixth on the team in scoring. But Richards value goes far beyond the numbers that he puts up, just like in New York. He’s a veteran leader and a great locker presence. 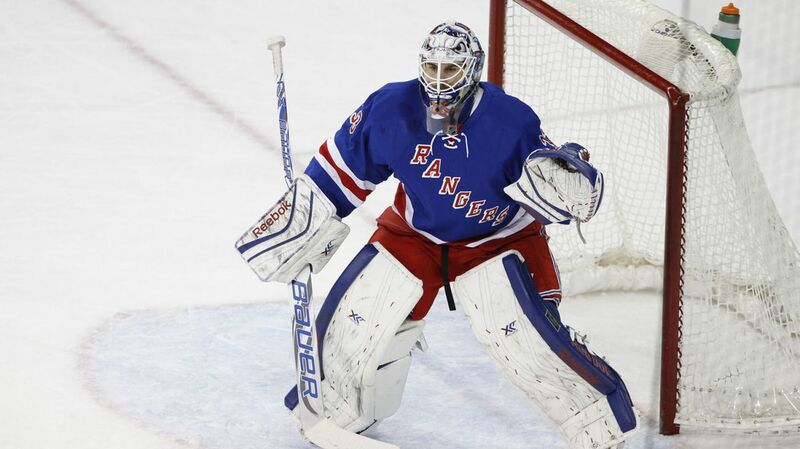 Richards was a very important part of the Rangers the last three seasons, and a respected player in the league. He’s looking to snap a 22 game streak without a goal. Corey Crawford will likely be back in net for the Blackhawks. This season he is 26-14-4 with a 2.26 GAA and a .922 save percentage. Cam Talbot will be making his seventh consecutive start for the Rangers, and has been tremendous in his last two starts. The Rangers are 10-2-3 without Henrik Lundqvist, and Talbot has made all but one of those starts, a really tremendous feat for a team without one of their best players. The more that he has played, the more comfortable Talbot has been. He will be in search of his 14th win of the season. Rick Nash scored a goal against Nashville, but it was an empty netter, making it five starts without an even strength goal. He still has 60 points (38-22-60), and I’m not complaining at all, but Nash is long overdue to blast one into the back of the net. Nash has 25 goals and 52 points in 57 career games against the Blackhawks. 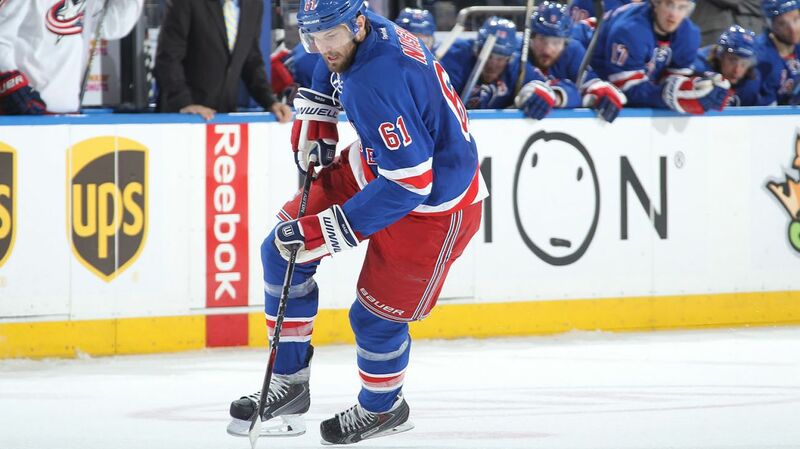 Rick Nash came close to scoring in Detroit, and will look to continue his success against the Chicago Blackhawks. Photo courtesy of MSG Photos. Keith Yandle has been pretty solid since coming to New York, and is playing a familiar team tonight. Haying come from the Coyotes, a Western Conference team, Yandle has faced Chicago a lot in his career. He has six points in his last five game against the Hawks, and will be looking to pick up his first point as a member of the Blueshirts. The Rangers have quite a few players streaking lately. Derick Brassard has 15 points (1-14-15) in the last 16 games, and Mats Zuccarello has four assists in the last four games, as well as 15 points (5-10-15) in the last 17 games. 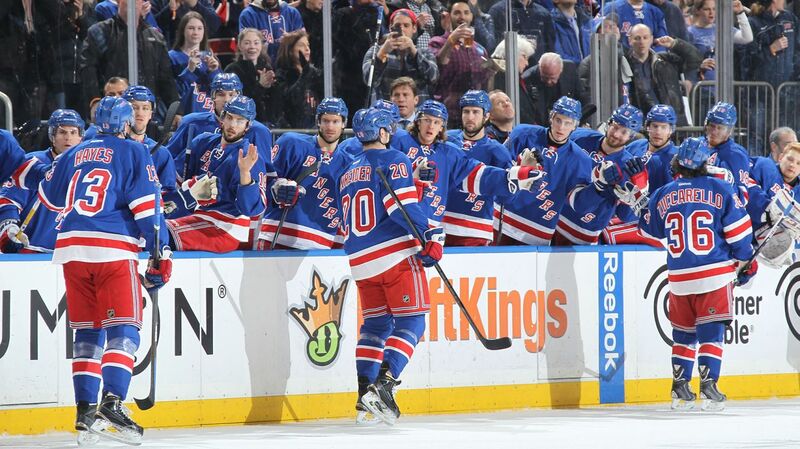 What may be more impressive is the play of Chris Kreider. He has continued to get better as the season progresses, showcasing his scoring touch lately. Kreider has three goals in the last four games, 19 points (12-7-19) in the last 29 games, and has tied his career high in goals (17). The Rangers are 17-0-1 in the last 18 games he has recorded a point. 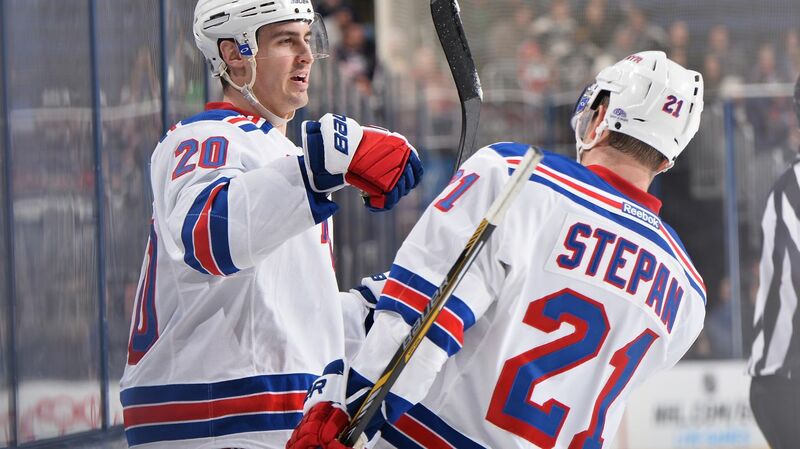 Whenever Chris Kreider records a point, the rangers have done really well. Kreideris one goal away from setting a new career high. Photo courtesy of Getty Images. The Rangers were 1-3 on the power play in Detroit, and had some really good chances, but Jimmy Howard was tremendous in net. New York will be looking to keep scoring on the man advantage, especially with Yandle and Dan Boyle manning the points. The Rangers and the Blackhawks will faceoff at 7:30 PM at the United Center. The game will be broadcasted on NBCSN. Posted on March 8, 2015, in Game Previews and tagged Alain Vigneault, Brad Richards, Cam Talbot, Carl Hagelin, Chicago Blackhawks, Chris Kreider, Dan Boyle, Dan Girardi, Derek Stepan, Derick Brassard, Detroit Red Wings, Dominic Moore, Henrik Lundqvist, Jesper Fast, Johnathan Toews, JT Miller, Kevin Hayes, Kevin Klein, King Henrik, Mackenzie Skapski, Madison Square Garden, Marc Staal, Martin St. Louis, Mats Zuccarello, Matt Hunwick, MSG, MSL, New York Rangers, NHL, NHL 2014-2015 Season, NY Rangers, NYR, Patrick Kane, Rangers, Rangers Nation, Rangerstown, Rick Nash, Ryan McDonagh, Tanner Glass, The Ranger Zone, Zuccarello. Bookmark the permalink. Leave a comment.